The latest installation in the library gallery includes locks of hair and pressed seaweed. Enjoy these installation photos and be sure to come see this exhibition on the library level next time you visit the museum. We couldn’t resist sharing these fantastic images made from scans of glass plate negatives. Henry Allison shot these photos of Abott Thayer’s studio in the 1890’s. Learn more about the exhibition here and meanwhile soak up these fabulous photos. Library and Archives Focus Exhibit – Book Cover Binding and Design Now Up! We are thrilled to have our most ambitious library and archives focus exhibit to date open for visitors. This is some serious eye candy for book cover design fans. Here are just a few pics from the show but it really is worth seeing them in person. You have some time, the show is up until February 19, 2016. Detail of case one, various binding styles including accordion and stab sewn. Detail of case one illustrated Chaucer in foreground. Case two, Authors, Artists and Moviestars! Cover art attributed to Charles E. Buckley, former Currier Museum of Art Director. History of Wood Engraving, 1883. Marbled paper covers a student text from 1829. Cloth cover from the 1982 artist book The Circus of Dr. Lao. This year marks twenty five years of tours for the Frank Lloyd Wright designed Zimmerman House. To celebrate, the Museum’s After Hours event for August is a 1950’s themed bash. The library and archives focus exhibit will be open for view and we’ll have some scrapbooks and exhibition catalogs from the 50’s for visitors to peruse. This was a busy decade for the Currier. Check out some selections below! Announcement of exhiibiton of 66 paintings by jean Dominique Auguste Ingres in 1952. The Currier was featured in this 1955 publication by the Manchester Chamber of Commerce. An exhibit of the League of New Hampshire Arts and Crafts, now known as the League of New Hampshire Craftsmen. Cover of the Granite Stater magazine from 1959 featuring the original main entrance of the building. Death announcement of Maud Briggs Knowlton, first director of the Currier Museum of Art from 1929 – 1946. After hours event announcement from 1958. The Midsummer edition of the The Bulletin from 1946. DigitalCurrier is the first initiative of its kind for the Currier Museum of Art. The Museum Archives, located on the basement level of the museum, contain the institutional records of the institution from its inception in 1914 and opening in 1929 to the present. DigitalCurrier aims to provide high quality scans of Currier Museum of Art publications for educational use. 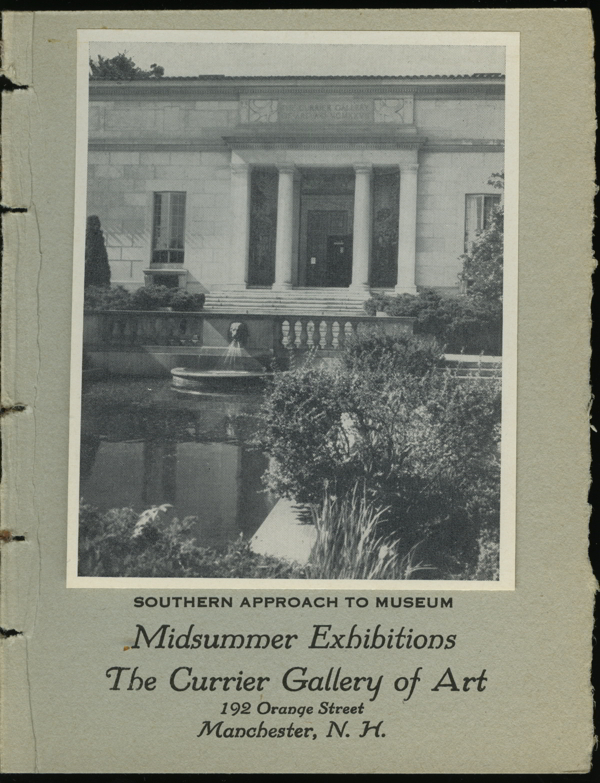 DigitalCurrier currently includes all of the issues of the Museum’s first publication, The Bulletin, published between 1929 – 1994, as well as several dozen exhibition catalogs.